Films : Bring the family along for a wonderful night under the stars watching Satellite Boy, plus local films about Aboriginal cultural knowledge from Through Our Eyes, shorts from the Western Catchment Management Authority and the Western Catchment Aboriginal Advisory Group, as well as ABC Open shorts, including Mail Lady of West Darling and Drive-In Dreamer. Special guest Aaron Pedersen will be in Broken Hill this November, to introduce his latest film, western-style thriller Mystery Road, which opens the outback tour of the National Film and Sound Archive’s annual Big Screen Film Festival this year. 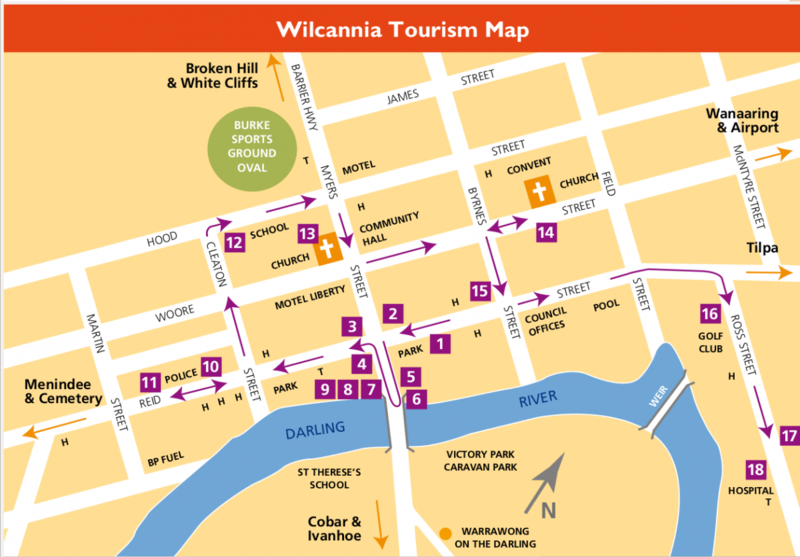 Big Screen will tour the NSW outback towns of Menindee, Broken Hill and Wilcannia, from November 28 to December 1, with brand new films, classics from the NFSA’S collection and some fun special events over the 4 days. The Festival begins in Menindee on Thursday 28 November, with a FREE outdoor screening of Satellite Boy, a heart-warming story starring screen icon David Gulpilil, with food and entertainment before a sunset screening. film Mystery Road, followed by a Q&A with guest star Aaron Pedersen. Come and be pampered on Saturday 30 November at the Goddess Beauty Bar, included in the ticket price, before the screening of stylish Australian musical comedy Goddess, starring Magda Szubanski and Ronan Keating. Saturday afternoon is all about cars and stars, when Eric Bana’s film Love the Beast charges onto the big screen, with a special line-up of cars from Broken Hill Vintage and Veteran Car Club as part of the fun. surrounds will play at the Broken Hill Art Regional Art Gallery. Silver City Classics features the work of legendary photographer and director Frank Hurley and early local newsreel footage. Also on exhibition will be film stills by Ivan Sen, featuring the stellar cast from Mystery Road, as well as new art gallery exhibitions. Big Screen hosts a free outdoor screening and BBQ in Wilcannia on Saturday 30 November with Satellite Boy plus local shorts about Wilcannia, from ABC Open and the Through Our Eyes project. Big Screen Film Festival is an initiative of the NFSA to bring new and archival films to audiences across regional and rural Australia, including new films, plus ones from the on-going collection. Tickets:From Silver City Cinema - Ph: (08) 8087 4569. All other venues are FREE, no tickets sold. Films: Satellite Boy plus short film Polarised, with food available and free entertainment from 6.30pm. manage to maintain them.” John De Fore, The Hollywood Reporter. Friday 29 Nov., 6pm for 7.30pm : OPENING NIGHT with Special Guest Aaron Pedersen to introduce his new film Mystery Road, a western-style thriller named as “easily one of the best Australian films of the year” by Guardian.com ‘s Jim Poe. Plus Silver City Celebrates 75 Years from the collection. Tickets: $12 includes Opening Night Drinks at the Broken Hill Regional Art Gallery from 6pm, Official Opening and films from 7.30pm at the cinema plus a Q&A with Aaron Pedersen after the film. Sunday 1 Dec., 2.00pm : COMMUNITY FUNDRAISER! 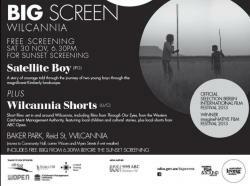 Experience the magic of Satellite Boy when this beautiful film screens in Broken Hill. Also screening is Naming of the Federal Capital 2013, a look at the naming of Canberra with footage from 1913 and a contemporary soundtrack from the Stiff Gins. Tickets: $12: includes films, light refreshments and fundraiser for the Red Cross. Gallery Open daily 10.00am – 5.00pm . Big Screen films & exhibitions from Thurs 28 Nov – Sun 1 Dec.